SwiftKey updated its beta app with a new flow experience more than a week ago and has since started rolling that to stable users (though not everyone seems to have it just yet). But unlike many updates, this one has loyal users up in arms and hating every single bit of the change. 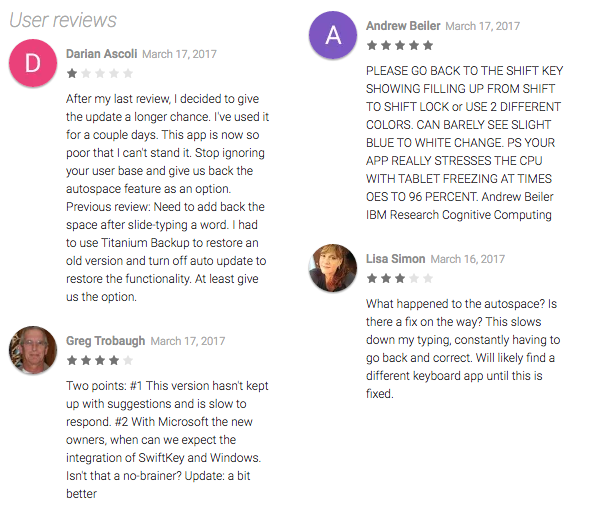 As a result, the SwiftKey Support forum is full of complaints and the feature has been downvoted to -39 (minus 39) points, the Play Store listing is overflowing with people revising their reviews and giving it 3 or 5 stars, and the most loyal of users are either uninstalling the app or threatening to do so. And as it turns out, that's for good reason. One sample of the updated Play Store reviews. The new Flow experience changed one fundamental thing about the way SwiftKey's Flow works: it no longer offers predictions for the next word in the suggestion bar, but corrections for the already swiped word. If you want predictions, you need to tap to accept one of the suggested words first. As long as I have known it, SwiftKey has been synonymous with predicting what you'll say next, so changing that seems like messing with the core of the experience. But that isn't all. Left: Old Flow predicts the next word(s) and inserts a space. Right: New Flow doesn't. The new Flow is also confusing everyone as to how spaces and capitalizations are handled. Previously, when users swiped and lifted their finger, the most likely word would be inserted followed by a space, and the keyboard would just be ready for them to continue with their new word. 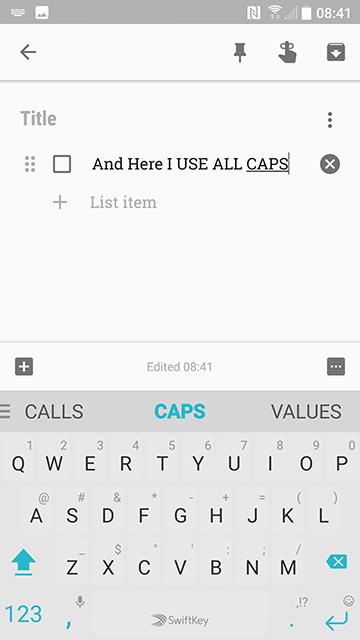 Now, when they swipe and lift, the most likely word is inserted without a space, but if they swipe the next word, a space will be automatically inserted before it as if it was there. Thing is, users don't see a space, they type a space, so they end up with two spaces, the one that shows up after being invisible and the one that they added manually. 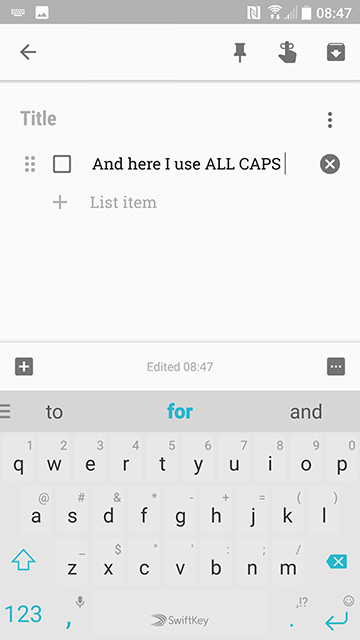 This new spacing behavior works the same way that Gboard does, so Swiftkey is probably trying this as a way to attract new users and not confuse them with the way swiping and spaces are handled, but it's backfiring and serving as a huge confusion for existing users who are completely rooted in the previous behavior. Maybe they could get used to the new way, but boy is it going to take time to learn a new behavior! The other change is affecting capitalization. Now, when users press Shift or Capslock to capitalize the letter or word that's coming next, SwiftKey also capitalizes the word before (probably because the cursor is still stuck on it). That's one very nasty annoyance that I couldn't explain no matter how hard I try. It's not a different way of doing things like the space handling, it's an illogical way that goes against the way keyboards have worked since time immemorial. 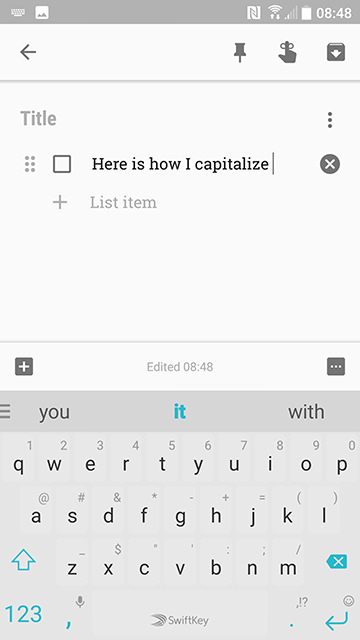 Left: Tapping Shift before "I" only capitalizes I. Right: New Flow also capitalizes "How." 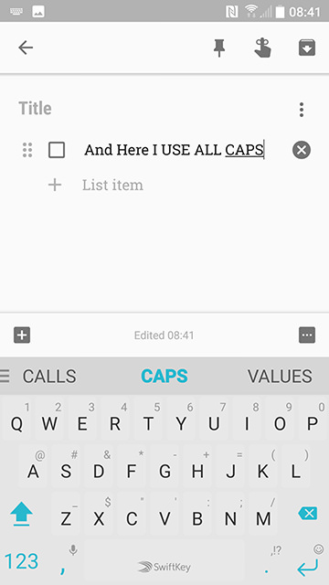 Left: Locking caps after "use" capitalizes the words after it. Right: New Flow also capitalizes "USE." 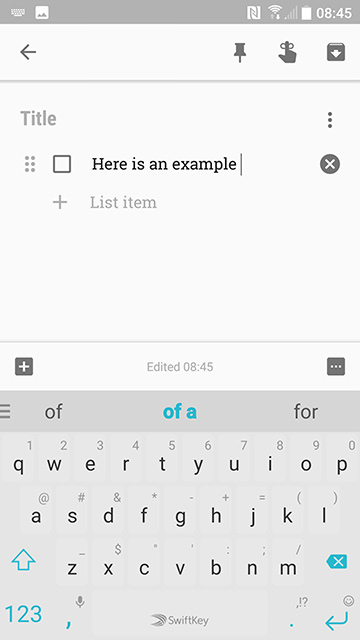 There are also plenty of other ways this new Flow experience has ruined typing for existing users, including one troublesome bug with text selection, but the issues I cited here are the major ones affecting and annoying nearly everyone universally (i.e. not fringe cases). We've been monitoring the support forum looking for a word from the SwiftKey team regarding this change, but the replies seem to be tone-deaf to users' complaints. Case in point, this tweet. Thanks for your feedback – we appreciate it. We are all aware of the response and are monitoring the situation to determine the best course of action, and to improve the keyboard for all of our users. Thanks again for your support here. We will keep you posted on developments with this. That... doesn't sound encouraging at all. If you want to avoid this issue altogether and can't wait for an official answer, grab SwiftKey 6.5.3.35 from APK Mirror (beta release, stable release). Many users on the support forums are reporting that it brings the keyboard back to its old way and rids them of the new Flow experience for good. Make sure you disable updates on the Play Store though, because you don't want the app to auto-update after that.